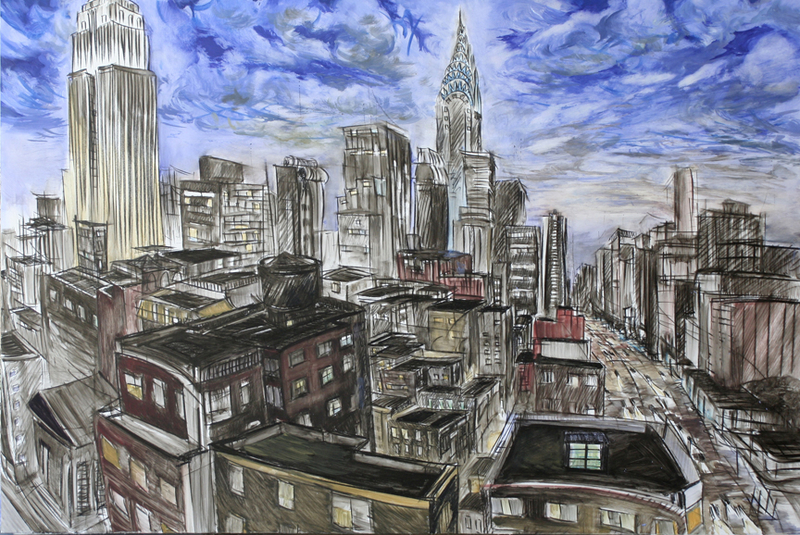 Helene Mukhtar and Steve Zolin both FSU alumni and founder of iArt-4 will show their work at the Fountain Art Fair, NYC 2013.
iArt-4 is a group of New York-based artists whose work reflects New York City cutting edge culture and the eclecticism of contemporary art. Their work embraces a wide range of media, from painting and photography to animation and installation. Helene Mukhtar’s paintings celebrate the human spirit and life in all its forms. Her preference for vibrant colors is rooted in her youth spent in the Mediterranean sun. She uses minimal, simple shapes and her paintings style is spontaneous and expressionist. Inspired by cartoons, street art and medieval bestiaries, her paintings are animated with line drawings, symbols, collage, animal and human forms. Steve Zolin’s highly charged gestures appear as human figures, cityscapes, and abstract patterns. By combining these with a unique kind of curved perspective in both painting and sculpture, Zolin explores the structure of space, which he sees an infinite whirling machine. He exhibits regularly in New York and abroad.